It was a good night for the CareyHigh School boys’ and girls’ basketball teams Tuesday night when the Castleford Wolves visited Carey for Northside Conference games. The Carey boys (6-6) won their fourth consecutive game with a 40-36 victory sparked by a 16-point scoring effort by Baley Barg (16.0 ppg). The Panthers broke open a 15-15 halftime tie with a 12-7 edge in the third quarter and stayed on top through the end of the game. Carey lived with the 3-point shot in its five previous wins, but relied on tough defense in a rematch of last February’s Northside tournament championship game won by Carey 57-56 on the Murtaugh floor. Scorers were Jordan Dilworth 6 points, Jack Cenarrusa 6, Dillon Cenarrusa 6, Chance Chavez 4 and Garrett Lee 2. In Tuesday’s preliminary, the Carey girls (6-4) won their second straight game 41-27 over Castleford behind 21 points by Jaide Parke (12.1 ppg). Micaela Adamson added 12 points, Nicole Gomez 5 and Morgan Parke 2. Carey started fast, building a 22-11 halftime lead. The Carey teams entertain CamasCounty today, Friday and go to Murtaugh Tuesday. The Wood River Wolverine girls’ basketball team (6-9, 3-5 league) put together its second straight strong offensive performance but came up on the short end of a 59-53 score at Burley Tuesday night in a Great Basin Conference game. Haylee Thompson (15 points, 5 rebounds), Kaitana Martinez (15 points, 4 steals, 9 assists) and Cheyenne Swanson (8 points, 9 rebounds, 3 blocked shots) led Hailey (five 3-pointers). 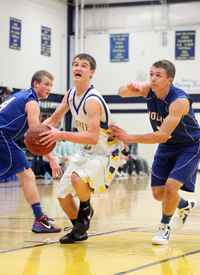 The Bobcats outscored WoodRiver 15-4 in free throws, including 4-of-5 in the final minute of the close game. Other WRHS scorers were Haillie Taylor and Hannah Belloli 5 points each, Ciceley Peavey 3 and Emmalie Dion 2. Burley (8-8, 4-4) put three in double figures led by game-high scorer Aubrie Vale (17, three 3s). Burley hosted Twin Falls (11-6, 6-2) Thursday. Jerome (12-4, 5-3), a 43-42 home loser to Twin Falls Tuesday, visited Canyon Ridge (4-13, 0-8) Thursday. WoodRiver hosted Minico (12-5, 6-2) on Thursday night and travels to Jerome Tuesday. CommunitySchool basketball teams hosted Bliss Tuesday for Northside Conference games at The Fish Tank. The Cutthroat boys (5-6) snapped a five-game losing skid with a lopsided 63-11 win over the Bears. Top scorer Will Brokaw (22.7 ppg) had the hot hand with 29 points including four 3-pointers. Brokaw added 10 rebounds for a double-double. Henry Rickbeil (15 points, 16 rebounds) also recorded a double-double for Sun Valley and Colton Sholtis (9 points, 12 boards) just missed one. Other scorers were Bobby Corker 5 points, Doug DuFur 3 and Taylor Adler 2. The Cutthroats visited Castleford Thursday night. The Cutthroat girls (0-9) led 17-8 at half but eventually fell 26-20 to Bliss. Sun Valley scorers were Ella Marks 8 points, Hannah Dies 6, Chloe Chrysikopoulos 4 and Taylor Figge 2. Cutthroat teams resume action Monday at Richfield and Tuesday at home against Lighthouse Christian.